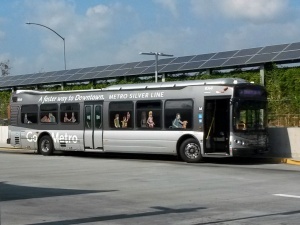 Silver Line operates on El Monte Busway and Harbor Transitway, with on-street alignment in Downtown Los Angeles and San Pedro. This line charges a premium fare over the regular express bus fare (See schedule for fare). Silver Line 910 trips operate 24 hours a day between El Monte and Harbor Gateway. Line 950 trips operate daily (no late night and overnight) between El Monte and San Pedro. Between El Monte and Downtown Los Angeles, the bus accepts passes from Foothill Transit as a part of the Silver 2 Silver program. Foothill Transit also accepts LA Metro's passes on its Silver Streak route between El Monte and Downtown LA. Riders with either pass can board whichever bus that comes first. ⚠️ All door boarding: TAP card is required for fare payment. Riders with TAP can board through any door at all stops and tap card at validator located at front and rear doors. Cash riders can buy a TAP card ($2 in addition to fare) at the front door of bus. This page was last edited on 14 October 2018, at 17:05.